Though the header appears to be misleading, I meant every word of it. Questions will arise that how can a recycled gun be meant for ardent readers? 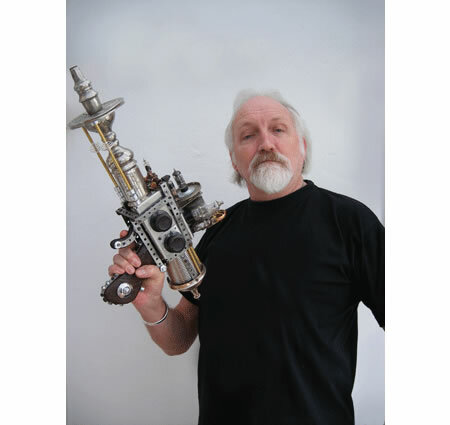 Read on……The BIG RAYGUN ACTION is recycled out of a hookah, old radio parts and a few parts from Meccano kit. Robert Rankin has built this distinctive piece of recycled art for the cover of his 31st book, Retromancer. 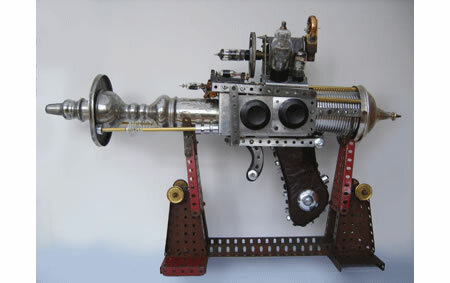 Since the book about the Second World War, this badass big ray gun complements the content. Though not much is known about the making of this recycled gun, I can tell you that the author believes that the book that it will adorn is the best book he has ever written. So don’t miss that! Robert Rankin is the enormously successful author of humorous fantasy novels, among them the Cornelius and Armageddon Trilogies and the Brentford Series.